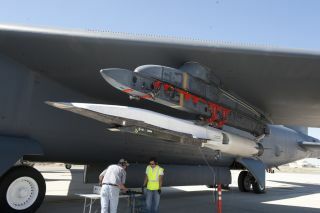 Ground crew members make the final checks to the X-51A Waverider scramjet, which is affixed to an Edwards B-52H Stratofortress, before the Waverider's June 13 flight test. Air Force engineers are scratching their ends after a test flight of an experimental hypersonic X-plane ended last month prematurely when the vehicle failed to reach full power. A rocket successfully boosted the hypersonic X-51A Waverider vehicle to just over five times the speed of sound (Mach 5) on June 13. The experimental craft's air-breathing scramjet engine then lit briefly on ethylene but failed to transition to its primary JP7 fuel, Air Force officials said. The X-51A attempted to restart but was unsuccessful. It continued in a controlled flight orientation, eventually splashing down in the Pacific Ocean in the Point Mugu Naval Air Test Range off the California coast. The test — which began when a B-52 Stratofortress mothership dropped the X-51A from an altitude of about 50,000 feet (15,240 meters) — was the experimental vehicle's second free-flying flight. The first occurred in May 2010, and it was more successful, with the X-51A's scramjet engine operating for more than two minutes. Boeing and Pratt-Whitney Rocketdyne developed and built the X-51A, an effort to demonstrate a viable hypersonic flight concept. Hypersonic flight is generally defined as anything reaching speeds above Mach 5 (3,805 mph, or 6,124 kph, at sea level). Engineers at the two companies, as well as the Air Force Research Lab, are reviewing the test flight's telemetry data in an attempt to identify what went wrong this time, officials said. "We will continue to examine the data to learn even more about this new technology," Brink said. "Every time we test this new and exciting technology, we get that much closer to success." The next test flight for the X-51A is tentatively slated for sometime this fall, Air Force officials said.